Scouts June 2017 What does it mean to you? The Scout Group has been going from strength to strength and as a direct result of this and the increased use from the Scout Group of the Pavilion, it was felt that the responsibility of the running and improving of the facilities rested with the Scout Group. As such Abernethy Scout Group recently took back the entire responsibility of the running of the Pavilion. However, thanks need to go to the outgoing Pavilion Committee who kept the building running over the past years and we are all very grateful for their time and efforts in the running of the building. Special thanks go to Katie McAleese (Chair Person) Karen Gourlay (Secretary) Tom Reilly (Treasurer) Jane Sanderson, Modreianne McCully and all the other committee members who have helped over the years. We felt that the roof would be as good a place as any to start with the maintenance and over the summer we have carried out works on the pavilion roof. Thanks to all the volunteers who turned up to spray and help scrape back the moss which took several days to complete. In the very near future we are looking to have a new kitchen fitted and replace the lighting and hope to have the pavilion decorated over the winter. It has to be stressed that although the pavilion is run by the Scout Group it is very much a community asset and is available for hire, (outwith the normal Brownies, Beaver, Cub and Scout nights) and would be a great venue for children’s parties or for other functions so please get in contact if you would like to hire it. 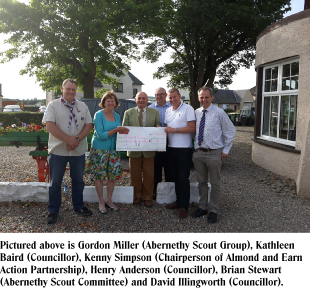 Abernethy were recently awarded a £7000 grant to go towards the improvement of the building from the Almond and Earn Action Partnership which will go a long way to improving the current facilities. Below Brain Stewart receives a cheque from Kenny Simpson at Bridge of Earn Institute who also received a grant. The Cubs have been busy prior to the summer and enjoyed their now annual camp to Fordell Firs for a weekend, where they camped under canvas and prepared and cooked all their food on the open fire. They also enjoyed various activities at the National Scout centre. This can sometimes be the first time that Cubs have been away from home, however, that never deters them from getting up at the break of dawn and they soon settle into the camp. Needless to say, they return home to their parents exhausted. 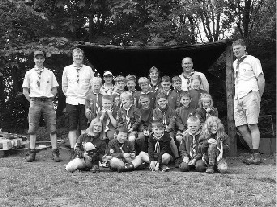 Pictured below are the cubs with the Leaders that attended the summer camp. .The Scouts had a successful summer trip to Lake Windermere where they went rafting and canoeing on the lake and caving in Yorkshire. I don’t think we could have had better weather whilst canoeing; the sun shone at 26 degrees with the slightest of breezes. 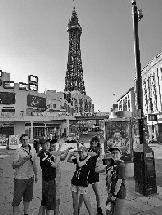 The trip culminated with a visit to Blackpool Pleasure Beach where I encountered G forces which fighter pilots don’t encounter; however all the Scouts had a ball which is what matters at the end of the day. It is sadly a year since we lost our friend and Assistant Cub Leader Gavin Robertson. Gavin who was a Cub and a Scout himself in Abernethy when he was growing up was well known in the village and we were delighted when we recruited him to help at the Cubs. As a way of honouring Gavin’s memory we have purchased a trophy which will be known as the Gavin Robertson Memorial Trophy and will be awarded to the Cub of the term,; this way we feel that Gavin will never be far from our thoughts. At the start of October members of Gavin’s family attended at the Cubs to present the Trophy for the first time. Abernethy Scouts recently went on a litter pick with staff from McDonalds Dunkeld Store between Aberargie and Newburgh. During this time, we filled 17 bin bags of litter a lot of it being fast food wrappers which had obviously been discarded out of the car windows. Our Leadership team continues to grow with Angela Dunn and Chris Farmer joining as Assistant Beaver Leaders. Along with Andy Smith and Dave Cheer who recently joined as Assistant Cub Leaders. This bring our current leadership team to twelve. Lorraine Kinnear is planning on standing down at Christmas. Lorraine stresses though that she would still like to be known as Baloo even after she leaves. Baloo puts her highlights of her scouting career down as being wakened at 05.00hrs by excited children when camping in the rain and having sole responsibility for arranging the annual visit to the Christmas Panto. Baloo has been a fantastic leader in our group and we wish her the very best. Finally, a big thank you goes to Jude Trotter who is off to University in Aberdeen, Jude was a young Leader firstly at Cubs and then for the last 18 months at Scouts and has been with our group for 4 years, we wish him all the success in his new adventures.